Once the RSA is refilled to $100 million, the surcharge is automatically removed. Further, should the RSA balance fall below $80 million, per ordinance the surcharge would automatically increase to 3 percent. The 1.5 percent surcharge will be applied to all residential and non-residential rates schedules, and will add about $1 to a typical monthly residential bill. This is the first time an automatic surcharge has been triggered since the RSA began operation in 2011. *Given the current outlook of hydro conditions and market prices. 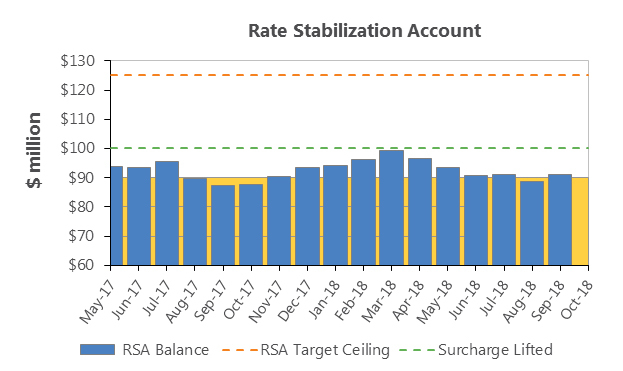 The Rate Stabilization Account (RSA) is a cash reserve of approximately $100 million that City Light can dip into when wholesale market prices or hydroelectric production changes cause an unexpected drop in revenue. If the RSA becomes depleted, automatic rate surcharges are added to your City Light bill to replenish it. City Light sells surplus power generated by our hydroelectric dams on the wholesale market. Surplus sales help to keep rates low by funding utility costs that customers would otherwise have to pay for through rates. Because it is dependent on hydro conditions and wholesale prices, surplus power sales revenue is very uncertain. The RSA helps to offset this uncertainty by supplementing revenues when surplus power sales revenues are below the budgeted amount. Conversely, cash deposits are made to the RSA if surplus power sales exceed expectations. The RSA balance is checked quarterly, and if the balance falls below certain thresholds, automatic customer rate surcharges will be put to into effect to provide funds to replenish the account. The RSA surcharge is capped at 4.5 percent. If the account's balance drops to $50 million or less, the City Council is bound by ordinance to determine actions to replenish the account to $100 million within 12 months. The RSA has been in use since January 1, 2011. The Strategic Plan includes steps to transition to a more conservative net wholesale revenue budget, which will greatly reduce the chances of customer surcharges in future years. This reduction is being implemented gradually through 2020 to soften rate impacts for customers.